I hope this finds each and everyone of you enjoying a happy end of the year, whichever way you like it best! Here is my last sewing project before Christmas – a Cosmo Dress! Hot Patterns’ Cosmopolitan Dress and I have a complicated history. I have always loved the pattern and this was my first purchase from Hot Patterns. The first time I made it, however, some of you may remember that I was losing my Grandma and I majorly messed it up. I never touched this dress again. The pattern stayed in my pattern drawer for a long time; I glanced at it occasionally, until I was finally ready to dig it up again. This time around, it worked. Cheer with me, friends – I have finally conquered the Cosmo! That being said, the sewing wasn’t exactly a walkover. I cut a size 6 for the back and a size 8 for the front, but I should have made a size 6 all around. The back was a perfect fit. I didn’t use a zipper as I was sewing with a knit, so I took out 1.5 cm from the center and cut it on the fold of my fabric instead of cutting two pieces. The front, on the other hand, was just huge on me, with way too much fabric both horizontally and vertically from the waist up. I wasn’t expecting the front to be so big – I usually cut front pieces a size or two bigger than the back, because my back is unusually narrow. Muslin, you say? Finding a pretty knit here is already quite a feat (I got this one online and was really lucky with it), so no – I don’t have spare knit fabric for muslins. – made the front darts 1.5 cm deeper. That really helped, but there was still too much fabric in the bust area lengthwise; again, the sleeves were already set in and serged, so unpicking the shoulder sleeves was not an option. In the end I also made darts below each shoulder seam to pinch in the extra fabric. The print of the fabric is so busy that it is barely noticeable unless you knew it and had your face right against my shoulder 😉 – it just looks like an unusual detail IMO anyway, not something that was fiddled with. I remembered reviews on PR and blogs warning that the neckline was low, so I redrafted the slope of the neckline so it was raised by an inch or so at the center front. I also changed the finishing for the neckline. This is were I had majorly messed up 3 years ago (though really, what was I thinking back then – facings in a knit fabric? ); this time I did one of my favourite neckline finishes for knits: contrasting binding that is sewn stretched out, so as to stay close to the body when worn. I used a black knit fabric for this, that has a bit more body and resiliency than the main fabric. My last alteration was the sleeves. I wanted neither the scarf-style sleeves – not practical for work – nor the huge sleeves gathered at the cuff – way too big for my small frame. I Frankensteined the sleeves from my trusty and much-worn New Look 6429. One final thing regarding construction: I sewed the side seams and sleeves all in one go, as most of us do when we sew with knits and sleeves do not need easing. This dress will be wearable in the spring as well, but right now, I am making it work as a winter dress with thermal underwear (and an extra black top underneath if it’s really cold), boots and opaque tights (or woolen tights if it’s really cold); and it is a great match under my beloved purple coat. My usual accent accessories (oversized cowl, gorgeous cabled fingerless gloves that were a gift from dear Tany a couple of years back, and I’m currently making a matching béret) are grey, so this purple and grey print was just ideal. Excellente fin d’année à toutes et à tous !! Have a wonderful end of the year, everyone. It looks to me like you nailed that pattern! It looks great! Great job on the dress, the entire outfit is gorgeous. Merry Christmas and Happy New Year. You did such a lovely job with this dress! I'm so loving it with the purple tights on you!!! It was Trena who got me wearing glasses again and looking for more fun tights! The HP Cosmo is one of my favorite dresses and the print is beautiful. I also don't muslin knits. I have a hard enough time finding knits I want to sew with nevermind ones that I don't. Lovely dress. The purple is beautiful on you. 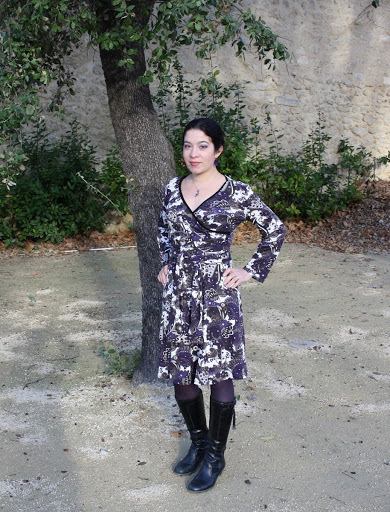 Beautiful dress and thanks for linking to Trena's keeping-warm-advice. A dress is so nice to feel feminine. What a pretty dress! 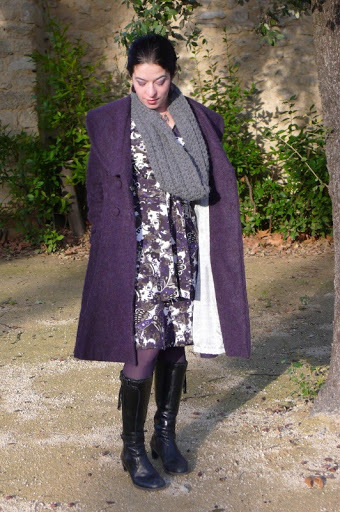 The combination of purple coat and gray accessories makes a very smart looking outfit. What a beautiful dress. I love the vivid color. Very nice work. You look great in the dress! Glad it was finally a success for you. Wish you all the best for 2011! The result was really worth it, so lovely! I sometimes by sale knits from Elingeria. (Restekiste – Sparpaket Jersey-Stoffe) They are 15 EUR for 3m and the quality is always great. Either I like the color and material so they will become a wearable shirt, or the quality is good for underwear so I will make that or I do not like color and pattern… then it's cheap enough to make a muslin and either wear it as night dress or just throw it away after the corrections were made. At least I never was decieved so far. cette tenue est très réussie, bravo! tu es très élégante! ton colis est arrivé à bon port! Your dress is very pretty and the fit is perfect. It looks lovely and warm worn with the tights, coat and soft cowl scarf. I admire women like you and Trena that can dress warmly and still look so chic. I tend to pile on layers of shapeless sweaters. You look so lovely! The cut and color is good for you, I am so glad you that you were able to fix it so that it is wearable. The dress is fabulous, Isabelle! I have this pattern, but have yet to attempt my first knit dress. You are an inspiration! Lovely job on the dress Isabelle and the entire ensemble looks fabulous. Glad you got to spend Christmas with both your families. There isn't a better way to celebrate this wonderful season than with our loved ones. Wishing you and yours a great 2011. Beautiful dress Isabelle. Perfect with the coat. Lovely dress and the styling looks perfect. Happy New Year! I am flattered both that you like my style and think we are the same size. LOL LOVE the dress. HP doesn't work for me because the bust area is just too big, but I love your workarounds for it. A fabulous dress! Gorgeous dress and I love your purple coat! Happy new year! Gorgeous dress & I like your purple coat too! An overall beautiful look! Perfectly put together. You made the most of some fitting challenges – one would never know from looking that you experienced even one issue. I really like your neckline finish, too.